Tip: With the exception of Skywatch, the navigators / caravaners can take to all of the Litany of Blood target towns if you do not have all the wayshrines unlocked. 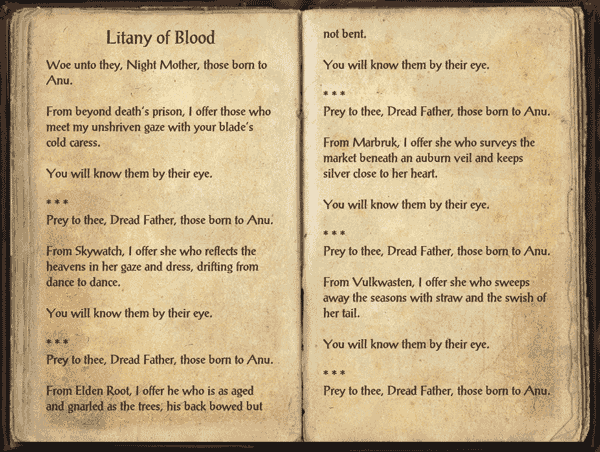 Talk to Nevusa to get the Litany of Blood Quest. Talk to Nevusa and obtain your own copy of the book. Return to the Dark Sanctuary and claim your Polymorph, Title, and Achievement. Note: I unlocked this quest after I completed my first Sacrament. Also, the targets will wander in their respective towns. Often they are found near markets or guilds. Cimalire, a female Altmer  a white only left eye wearing a blue dress and. I found her wandering around the mage guild area. Diredelas, an older male wood elf with a bow on his back. Often found around the Outside Inn: below fishing, listening to the bard, or enjoying a drink inside. Caraleth, a tattooed red-headed fighter, often found in the Fighter's Guild. Sihada, a noble khajiit sweeping the walkways around  Vulkwasten. Dablir, a well-dressed Khajiit male that can often be found strolling between the blacksmith forge and the guild traders. Dinor Girano, dark elf noble, likes to walk the promenades overlooking stairs leading down to the docks and wander around the bank. Also, likes to browse the Mystic area. Cindiri Malas, a proud dark elf soldier that often stands watch in the Royal Bazaar wearing her Red Pact Armour. Gideelar, an argonian female with horns that circle her head like a halo likes to clean up town with her rake. Frequently seen near the dye table. Hakida, an elderly woman with a braid around the top of her head, likes to take strolls by the Fighter's guild to watch the brawny Nords work up a sweat. Eldfyr, a proud male Nord wearing green and circlets at near each elbow, that has been seen walking from the market to the Fighters' Guild, where he will wander the upper floor in search of a strong drink. Cesarel Hedier, a bald male who likes to stalk the dark narrow alleys northeast of the Daggerfall stables. Alix Edette, a red-headed dockworker dressed in blue, works in the southeast part of town. Bulag, the knife juggler, likes to entertains by the pack merchant and the guild traders. Occassionaly walks outside the walls west of the traders. Ebrayd, redguard with dreadlocks and a gold leaf embossed brown shirt, enjoys spending time in and around the blacksmith forge. “From Evermore, I offer she whose heart bears many scars, but does not fear to wear them proudly. Berea, redguard female with having visible scars on her chest frequents the graveyard after strolling from the Emporium, past the Anchor Point Inn (stops at the patio for a drink), and a visiting at the The Stalls. Previous PostESOTU Hireling Statistics?Next PostESOTU Do You Gamble with Improvements?